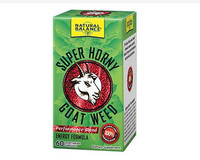 Super Horny Goat Weed, 60 Vegcaps (Natural Balance) - Penn Herb Co. Ltd.
Super Horny Goat Weed formula is an energy and male performance blend that also includes Yohimbe, Tribulus, L-Arginine, and nutrients. 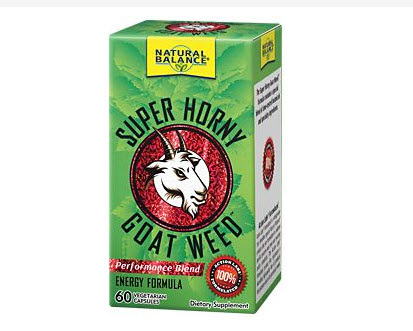 AMOUNT PER SERVING (2 CAPSULES): Zinc (Amino Acid Chelate) 15 mg; Copper (as Copper Alphahydroxy Complex) 0.2 mg; PERFORMANCE BLEND 1, 1175 mg - Horny Goat Weed (Epimedium spp. ), L-Arginine HCl, Yohimbe (Pausinytalia yohimbe bark extract), Tribulus Terrestris fruit extract, Mucuna Pruriens Bean extract (supplying 5 mg [10%] L-Dopa). OTHER INGREDIENTS: Vegetable Cellulose (Capsule), Rice Flour, Maltodextrin, Magnesium Stearate and Silica. Use only as directed. Take 2 Vegcaps daily, preferably with a meal. WARNING: Do not take more than the recommended dosage. Keep your licensed health care professional informed when using this product. Keep out of reach of children. Not recommended for excessive or long-term use. This product should not be taken with MAO inhibiting antidepressant medications. Do not use if have any heart conditions or hypertension. Not intended for use by persons under the age of 18, pregnant or nursing.